The President of the Catholic Bishops’ Conference of the Philippines (CBCP) has announced their bet, Atty. Aileen Lizada as the next Ombudsman, a Land Transportation Franchise and Regulatory Board (LTFRB) board member. In a letter he submitted to the Supreme Court, CBCP President and Davao Archbishop Romulo Valles said that Lizada has an “honor and integrity" to serve the country. Valles added that Lizada during her time as Ombudsman in Mindanao she is known as "crime-buster and anti-graft lawyer". 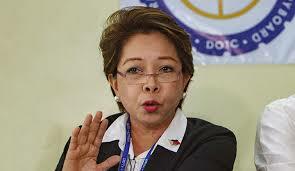 Now that the CBCP has endorsed Atty Lizada, I am pretty certain, she won't be appointed.